I think inclusion and political correctness have finally reached critical mass. Sexual assault by someone using their religion as motivation is preferable to being saved from said assault by your own countrymen. Because of this, I’ve a great appreciation for true artists, people like my college roommate Dave – who has been making art since he could walk. And the classical artists – Leonardo, Michaelangelo and such. Modern folks not-so-much. An exploration of random color splotches doesn’t move me as does La Giocanda. My friend Doc In Yuma sent me a collection of art (via email) which did move me. Not just because of the skill of the artist, but, because of the media used. Don Marco was born in Northern Minnesota in the late 1920’s. His interest in art was evident even before starting school. As a young adult in the Army Air Corp, he began his life’s career in Air Traffic Control, which continued until his retirement from Honolulu International Airport in 1973. Much of his spare time was spent as a professional artist. It’s hard to imagine these are done with crayons! It is with a truly heavy heart that I post this. I still have a wooden dollar, commemorating my going to the Arizona premiere of Blazing Saddles – somewhere. While I am no longer married (although my ex and I remain dear friends), I do have the distinct memory of asking her of doing me the honor of being my wife, after asking her to turn down the sound on the TV so I wouldn’t be interrupted. We were watching Silver Streak at the time. At least he can now be with his beloved wife, Gilda Radner. RIP, funny and talented man! Addendum – my sincerest apologies to the current Ms. Wilder. Gene remarried after the passing of Gilda, and she loved him for another 25 years. I’m sorry for your loss. Regular readers of GiA know I’m no sports fan. It’s only when a sports figure does something of note (as with many of the Olympic athletes) or does something onerous (as with some Olympic athletes) that it gets my attention. This Kaepernick guy apparently refused to stand for the National Anthem at the last game. And, in spite of the firestorm of controversy reacting to his remaining seated, said he will continue not to stand. Until things change regarding the oppression of Blacks in the United States. He’s Black. His parents are White. He makes NINETEEN MILLION DOLLARS A YEAR AND LIVES IN A MANSION. What could have happened? What oppression? Funny how the more narrow Internet search failed to mention this conversion. And the ‘news’ outlets in the broader version consisted of bloggers and sketchier news outlets (IOW, NOT CNN, NBC and such. WND for example). Which brings me to my point. Many of the folks leaving comments on the National Anthem story demand that Kaepernick be forced to stand. As repulsive as his behavior my be, forcing someone to stand in ‘free’ Republic doesn’t sound like an appropriate response to me. I’m a big believer in free markets. And voting with one’s feet, TV remotes and wallets. And via Email and post if necessary. If you don’t want to support this clown, don’t watch his game, buy his team’s foam fingers or products advertised. Hit ’em where it hurts. I LOVE this Republic and her Anthem. Singing along with my hand over my heart sometimes brings me to tears. But forcing someone to stand – that smacks of fascism, and certainly doesn’t paint a portrait of the Land Of The Free. I don’t care what religion he is. But, it IS interesting that the mainstream media has been soft-pedaling that information. I became a libertarian (small L) back in 1976. While I registered and voted many times for the party’s candidates, I never actually joined the national party. Initially, it was because of lack of funds. Now, it’s for other reasons. Then on Monday, Gary Johnson came out in favor of—drumroll, please—a carbon tax to fight global warming. The Libertarian party lost my vote the moment Johnson picked Bill Weld as his running mate. Weld has a proven record of suppressing the People’s Rights when he was governor of Massachusetts. Disarming Americans or placing any type of restrictions on any of our God given Rights is not what I thought the Libertarians were about. Between Bill Weld, who has waffled almost more than Donald Trump, and a belief in the global warming scam (coupled with a TAX! ), I believe the national libertarian party to be a shadow of it’s former self. The Libertarians of the 1970’s wouldn’t even consider voting for such tripe! Now comes the big question – do I vote Libertarian Statist, or for one of the other two major party Fascists? There are a number of items that have come and gone during my adult life as a ‘gunnie’. The Snik holster, and The Randall (Mirror-Image) Left-Handed 1911 are two examples. As with it’s revolver counterparts (the S&W Model 29 and Colt Anaconda) it’s designed primarily for hunting. But you know some fools (and larger folks) will carry them concealed. If you’re even passingly familiar with Clint Eastwood’s portrayal of Dirty Harry then you’re also familiar with his trademark .44 Magnum (the – at the time – so-called most powerful handgun in the world). And if you’re familiar with “Sudden Impact”, the fourth movie in the Dirty Harry series, maybe you also know about the Auto Mag. Or perhaps you know about the Auto Mag because it’s a badass pistol we’ve been promised another chance at more than once since its movie heyday. So where do things stand as of now? First, a little company-related background. The original Auto Mag went out of production more than three decades ago. Manufacturing costs apparently outweighed sales profits which eventually led to the pistol’s initial demise which led to a revival as a collector’s item complete with higher price tag. Many attempts were made to keep the gun on the market but in 1982, it all came to a grinding halt. Then, last year, a private investor decided to get involved. They purchased the rights, plans, and even leftover components before setting to work bringing back the Auto Mag. Now, as we edge into the fall of 2016, it looks as though progress has indeed been made. As of August 2016, Auto Mag is an officially registered trademark. The company is offering the lucky devils who already own Auto Mags their refurbishing services and caliber conversion kits will be offered soon as well. What calibers? We don’t know yet, but you can be sure we’ll let you know when we do. As for future Auto Mag owners, your day will come once the prototype is complete. 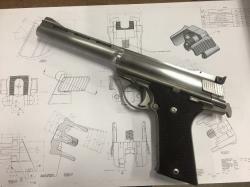 Firearm manufacturing has come a long way since 1982 in more than a few ways, meaning the new company has to take everything into consideration from metallurgy to machining. One good move Auto Mag has made is the choice to bring Laura Burgess Marketing (LBM) in to handle the media and marketing side. Marketing matters far more than many people realize – more than even some companies even seem to comprehend – and LBM is a solid choice. LBM will undoubtedly do their part to spread awareness of the pistol’s impending resurrection and will also keep us in the loop regarding future developments. I don’t expect to see this pistol hit production-ready status until year’s end, but it’s worth the wait. I, for one, am looking forward to trying my hand at the Auto Mag. Who’s with me? Some years back, Jeff Cooper was asked what would be the purpose of making such a firearm. His answer? To sell, of course! As recounted in an earlier post, I ordered a spring replacement kit for my S&W 442 electroless nickel snubbie. And subsequently received same. I decided to ‘bite the bullet’ and get to it, yesterday. (I have removed side plates and dealt with Smith revolver innards before.) Preparatory to this endeavor, I did watch two different videos on You Tube regarding proper disassembly. Just to refresh my memory. And I began the task at hand. Excited at the prospect of getting a snubbie with a lighter trigger pull. Two of the three screws WOULD NOT BUDGE! An analysis confirmed two things – yep, they were really in there, and the handle on my cheapie gunsmithing screwdriver was turning instead of the shaft! It probably didn’t help that I’ve NEVER removed the sideplate on this particular revolver in the 21+ years I’ve owned her! Sigh. (I know, my bad). What to do – What to do? Dig through mountains of storage boxes to locate my other (better?) gunsmithing screwdriver (with a bad back – me, not the screwdriver), or order another online (at additional cost)? Looking for suggestions to loosen the screws? Penetrating oil? WD-40? I’m now pretty comfortable with doing the spring replacement. If I could only get the &%$#$^Y&! sideplate off! I hope to update today’s quote, funny and beauty later. Following that, I was at home in bed recovering from the onset of my leg disability. Watched a lot of TV. And the show ‘Mission Impossible’ premiered. I WAS HOOKED! Both on the show’s premise and the MI team’s head honcho, Dan Briggs. He left after the first season, because he refused to work Saturday, being an Orthodox Jew. Later, he was a District Attorney on Law & Order. And was also memorable. My good friend Kevin (of the couple written about in these pages – Tomi and Kevin) asked I post a link to a candidate’s website. To sell bumper stickers. @ $10.00 a pop. For charity, of course! Which charity? Joe’s choice. The candidate is JOE MADDON. He is the manager of the ubiquitous Chicago Cubs baseball team! Nope. I support charities and my friends. And considering the field of already declared candidates, while I suspect he too may lose, he’s probably a better choice than the front runners.